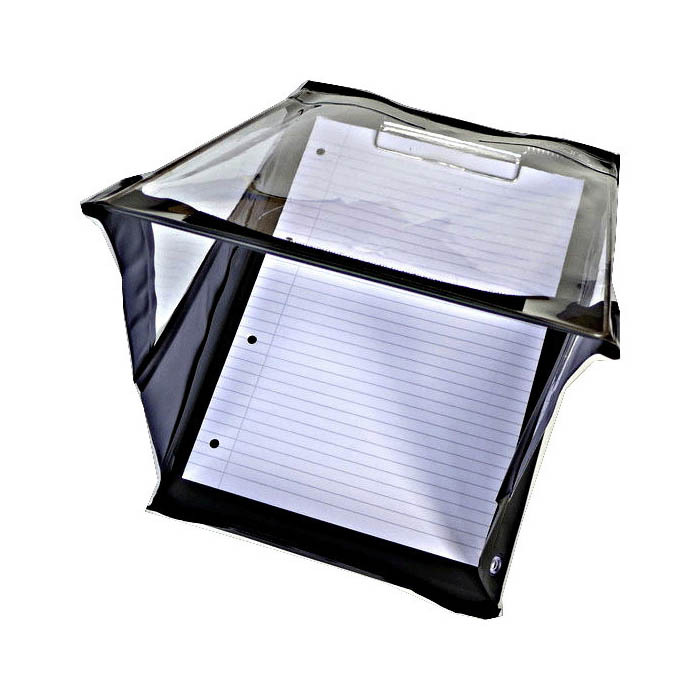 A spring-loaded cover protects your papers from the rain whilst you write. When you're not writing, the cover closes to keep your documents secure and dry (secured by a long strip of velcro.) Since the cover is see-through, you can still look at your documents when the cover is closed. A clip inside the cover keeps the documents secure. On the A4 Portrait & Landscape models, there's also a clip on the back (and two clips on the A3 model), so you can still use the weather clipboard when it's not raining. The clipboard cover is made of thick, see-through plastic that is built to last. The clipboard base itself is also waterproof with black, plastic material. On the A4 and A3 models, there are even two small slots built into the clipboard material to hold your pen and pencil.